The Dream Scroll community artmaking process gained further momentum on July 15, 2012 as nine nappers arrived fully prepared to nap with blankets and pillows in hand, in the home community of Gestare Art Collective member Medwyn for a collective re-storative, re-generative co-event. The dreamers dropped into dreamspace gathered around the dream scroll suspended above a hexagonal three-circuit labyrinth. 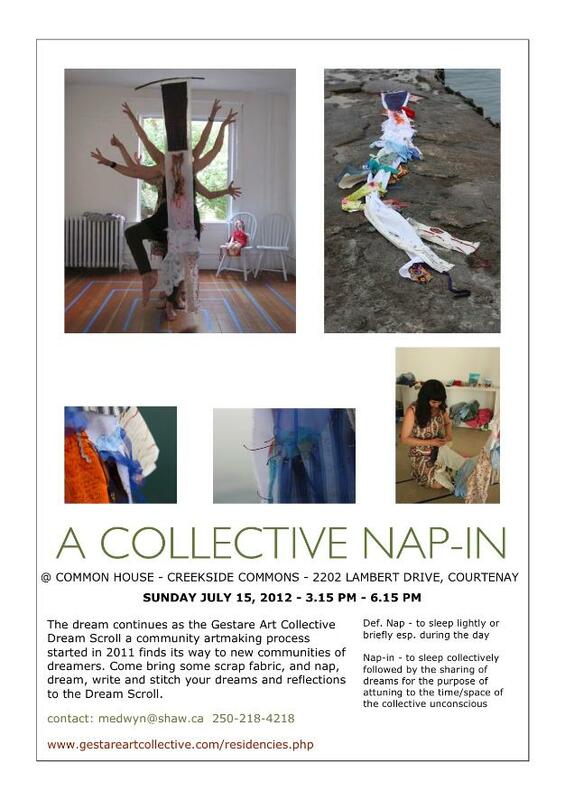 Napping was followed by dreamsharing as threads were sewn, fabrics torn, shaped and stitched to the dreamscroll bringing images from guidance, messages and insights drawn from the liminal space between the conscious and unconscious worlds.